We will send you a copy of the latest addition of Inside a U.S. Embassy, along with order forms. Speakers Bureau members may use this as a personal reference and/or as a door prize or gift at the event you speak at. 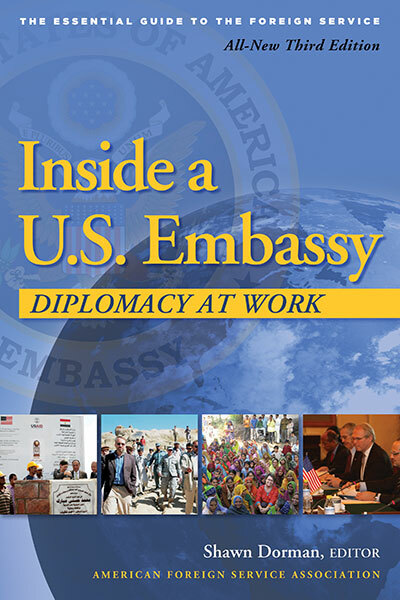 Please introduce “Inside a U.S. Embassy” in conjunction with your talk, as probably the best general introduction to the Foreign Service and its work, and please make the order forms available to attendees. For your free copy, please email fsjedit@afsa.org, reference the venue (the date you are speaking and the organization you are speaking to), and the address you would like the book sent to. AFSA is the professional association and labor union that represents nearly 17,000 active and retired Foreign Service employees. The Speakers Bureau is part of AFSA’s overall effort to educate the public about the work of the Foreign Service and the importance of diplomacy in U.S. foreign policy and international relations. Please note that ideas expressed by the speakers represent their personal perspectives and do not necessarily reflect official U.S. policy. While clearance is generally not required for remarks made by Speakers Bureau members (unless explicitly speaking on official U.S. policy), speakers are reminded of their responsibility NOT to divulge classified information and to use great discretion and to err on the side of caution in discussing any Unclassified but Sensitive information.